Sailing to windward in twenty to twenty-five knots of wind on the open ocean can be quite a challenge and ceases to be anything but an ordeal after several days of it. The boat struggles up steep hills and complains over each wave. 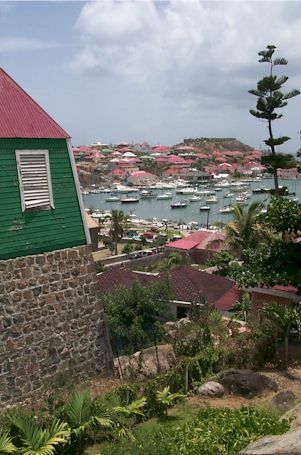 The sail from Anguilla to Marigot, St. Martin was against the wind. Two days after that we beat to windward to Orient Bay and then a few days after that we were hard on the wind to St. Barts. We were tired of it and dreaming of passages with the sheets eased but we’re proud of our little yacht and our ability to make progress in difficult situations. Our departure from Orient Bay was flawless. 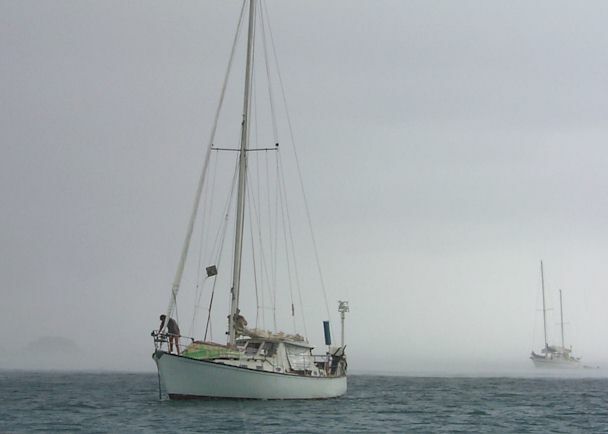 We sailed off the anchor and short-tacked out an entrance flanked by reefs. It was a sweet feeling to know that good friends, who have been visiting with us at Orient Bay, watched all this from the beach. For once we put on a good show. Once clear of Orient Bay we tacked toward St. Barts. Between our destination and us was the desolate island of Ile Fourche and as we approached it was hard to determine whether we were going to clear it or whether we going to have to do a couple of tacks to safely pass it by. With my hand at the helm I attempted to achieve every inch to windward. We were quite close to Ile Fourche before I was convinced that we would be able make it without tacking. Closing in from behind was a larger, faster French yacht. It was hard-chined and apparently made of steel, a common type of yacht amongst Europeans. Obviously the skipper was trying to pass Ile Fourche in one tack the same as I but to do it he will have to pass closer to the rocks at the far end of the Island. We finally pass at a comfortable distance after which I focus my attention on the French yacht. It’s obvious that he will clear but it’s close. When he finally did it I gave the skipper a high-five gesture, which he returned with a grand wave. We we’re both victorious over Ile Fourche and we saluted each other for our seamanship. 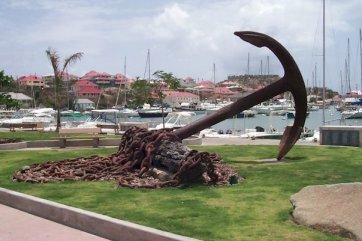 I wish I could say that the entire passage was without error but, alas, when we arrived at Gustavia I totally bungled the anchor drill. On the third attempt to anchor in a spot where we would not be too close to other yachts the anchor came free of the bow roller and put a few scars on side of the boat. While trying to put it back on the roller I bent my left thumb backwards and severely sprained it. Of course this was watched by numerous French yachtsmen who learned some English words that were not in the Phrase Book. When the anchor was finally down Linda asked me if I wanted something for my thumb. "Yeah, I’ll have a beer." She passed up a Carib Lager and some Motrin. Throughout the history of European expansion into the western hemisphere it’s been a common ploy to find a rock in the middle of the ocean and attract bargain hunters and smugglers by declaring the island a "free port." In 1784 Sweden offered certain commercial advantages to France and, in exchange, got the small Caribbean island of Saint Barthelemy or St. Barts. It had no agriculture or industry but that’s not what Sweden had in mind. It had a small but reasonably good harbor and was located on the trade route between the old and new worlds. They made it into a free port where merchants can exchange goods free of taxes. It became a thriving trade center and flourished until around 1852 when changing trade patterns caused it to fall out of favor. Becoming useless to the Swedes they sold it back to France in 1878. To this day, however, it retains its free port status. 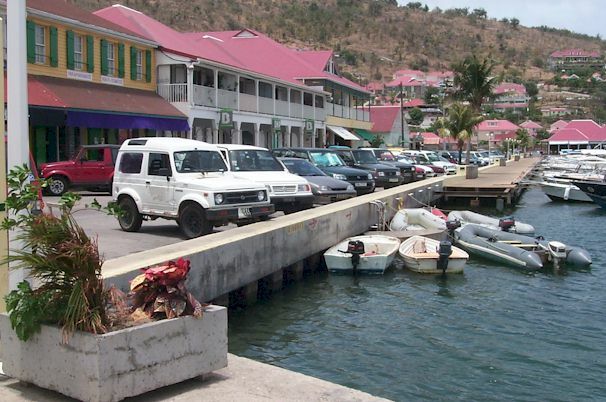 The only real evidence that Sweden ever owned St. Barts is the name of the capitol city, Gustavia, after King Gustav III of Sweden. Today St. Barts is known as a very upscale holiday destination and a watering hole for the rich and famous; the Riviera of the Caribbean. Because of that images of snobbishness can form in the minds of people from more common backgrounds such as myself. I am reminded of a TV commercial where an American tourist is deliberately ignored by two overly fashion-conscience French store clerks. Well, it’s possible to have a bad experience with a waiter or store clerk on St. Barts but it would most likely not be due to snobbishness. My problem has always been my attitude that you don’t try a new skill in public until you’ve learned it thoroughly. I have an aversion to making a fool of myself but the only way to learn a foreign language is to jump in and try to speak it even if you know only a few words. "Bonjour" said the customs agent as we stepped from the dinghy. "Bonjour" we replied. The man smiled broadly and switched to English. French is a beautiful language and the French are very happy to hear you attempt to speak it. My fears of making a fool of myself were unfounded. We tried our fractured French on everybody we spoke to and found them to be exceedingly friendly and helpful. 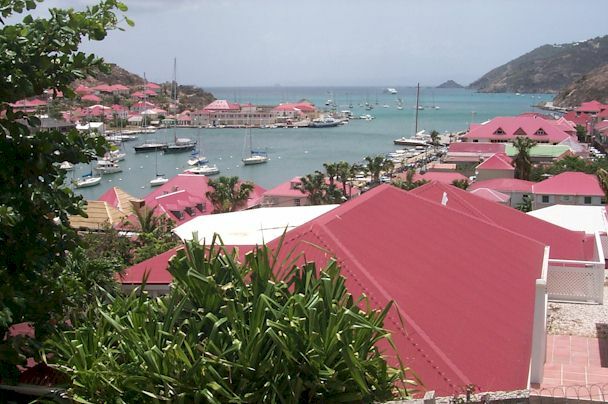 Gustavia is one of the most beautiful towns in the Caribbean and well worth a day visit from St. Martin if you cannot afford the high-priced hotel rooms on St. Barts. Living on a private yacht afforded Linda and I a unique opportunity to spend a few days in Gustavia for a very reasonable anchoring fee. We browsed in the "trēs chic" shops and were treated nicely even though it was obvious that we could not afford any of the merchandise. The French ambience was enticing. After a few more days of enjoying St. Barts we will be continuing south, probably to Guadeloupe, which is a passage of about 115 nautical miles. From there the passages will more than likely become easier. The hurricane season is upon us and it’s important to get well below the hurricane belt. I’ll do my best to keep you informed about our adventures.